Hommage a Jean Luc Lagardere and his legacy to the French Breeding & horse racing industry that Roland de Longevialle feels continues thru Prince Aga Khan’s continuing dedication to the industry. The Aga Khan took over the Lagardere stud farms in 2005. Muhaarar ‘s win in Deauville last week end in the LARC Prix Maurice de Gheest led to an encounter with Roland de Longevialle. 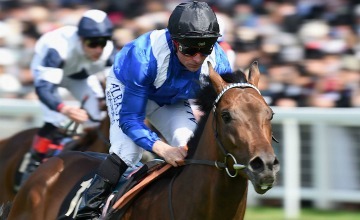 A series of reminiscences led us to discuss that in the Breeding family of MUHAARAR were horses bred by JEAN LUC LAGARDERE, for whom Roland de LONGEVIALLE was the racing manager for 20 years. LINAMIX – LUNADIX originated in the Lagardere Haras. .LINAMIX. out of MENDEZ & LUNADIX, thru BRETON., LINAMIX winner of the GRAND CRITERIUM .The Poule d’Essai des Poulains. Continues great victories, however, it is at the Jean Luc LAGARDERE Stud Farm that LINAMIX passes on the great talents., heading the Stallion stakes in 1998 & 2004. . His issue become winners of the great Group 1 races, winning 13 Prizes.. Including the mythic Prix de L’Arc de Tiomphe. won by SAGAMIX. Gran Premio deal Jockey-Club, Premio Roma & 2nd Prix de L’Arc de Triomphe with Cherry Mix. Prix Royal Oak was won twice by by AMILYNX. Grand Prix de Paris was won by Slickly, who also won Prix du Moulin de Longchamp. The Premio Vittorio di Capa also twice Prix Jacques Le Marois was won by Miss Satamixa . .2nd in the Ascot Gold Cup was Reefscape who also won the Prix du Cadran…Winner of the Poule d’Essai & Prix Jacques Marois was Vahorimix. Lagardere’s choice of trainers were the young Andre Fabre & JC.Rouget after Francois Boutin. Roland de Longevialle ran the stud farms of Jean Luc Lagardere, le Haras du Val Henry, and later on, the Haras d’Ouilly, that had at one time belonged to the famous Dupre family of Breeders. Jean Luc Lagaredere was one of France’s most dynamic & well known business personalities with interests in France’s important Defence industry, including Matra. 2 years after his untimely death,in 2003, Jean Luc Lagardere’s important Stud farm was sold to the Aga Khan. Roland de Longevialle signing the transfer in 2005 with Georges Rimaud the racing manager for the Aga Khan. Monsieur de Longeviale feels that LAGADERE’s passion & legacy continues through the strong investment by the Prince Aga Khan in the French horse breeding and racing industry Deauville La Touques race course .Racing organised by FRANCE GALOP. Photo MUHARAAR owned by H.AL MAKTOUM. at ROYAL ASCOT 2015.. WITH THANKS. COURTESY GETTY IMAGES.